Fancy a Nokia with 18-carat gold plating and a huge front display of a clock. This Nokia 8800 Sirocco Gold phone looks pretty classy and would sure make a statement in any fancy nightclub or golf club. I could see myself with one tooâ¦.So how would one keep the robbers away ? Make sure you have a GPS tag on this baby. It sports Triband GSM900/1800/1900/GPRS/EDGE support on a Series 40 interface. Weighs 139 g (heavy) with a standby time up to 10 days and talktime up to 2hours 45min. The display is 208 x 208 pixels, up to 262K colors but sports only a 2.0 Megapixel (1600 x 1200) camera unlike the flashy 5 megapixel Nokia N95 but you canât have everything. Inspired by nature, and one of its most beautiful elements, gold, Nokia today unveiled the Nokia 8800 Sirocco Gold – a bold and prestigious new style statement. 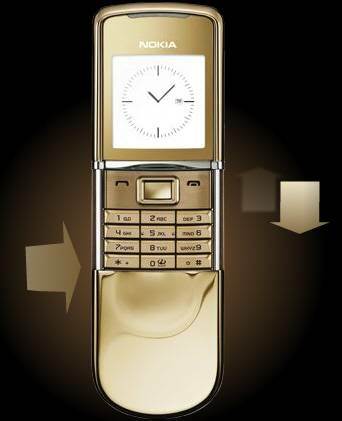 Encased in luxurious 18-carat gold plating, the precisely crafted Nokia 8800 Sirocco Gold combines timeless design with contemporary flair, resulting in an exclusive display of personal style and elegance. A sirocco is a strong wind, originating in the sun-bathed Sahara desert and travelling all the way to the Mediterrean. This blending of the strength and sensual beauty of nature is the inspiration for the extire Nokia 8800 Sirocco line. By enhancing this inspiration with gold â?? one of the most precious and enduring elements known to man â?? this harmonious blend of strength and beauty reaches a new level. Make Your Laziness Even More Severe With These 21 Inventions! Copyright © 2008 - 2018 Techzug.com. All Rights Reserved.